FWIW - I still like the 760 the best. Overall, it's the best sounding, most durable and best value-for-money model of the ProLine speakers. I know the ProLine Leslies will never become as prestigious and valuable as the 122 or 147, and that's ok. I still believe the ProLine Leslies are underrated, but I will agree that most specimens found today haven't aged that well. They have often been abused (or at least worked hard), repaired and modified in every possible way or have not been maintained properly. Still, they make great entry-level Leslies. The chapters in this new version of the ProLine pages are: This intro page, the 760 and 770, the 330 and 860, the 900-series, the 825 and 820. I may add a final chapter about the later ProLine speakers such as the 815. As usual, pictures or other materials is always accepted and will be credited on the pages (unless you don't want me to). 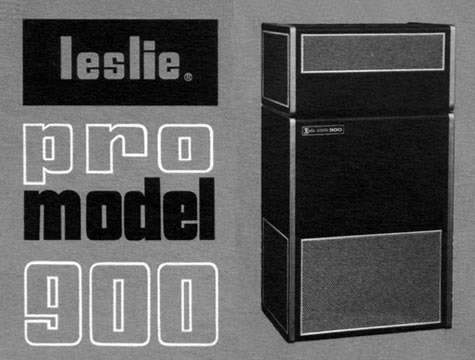 The tolex-covered Leslie model PRO 900 was introduced in 1969 and was the first in a long line of Leslie speakers made for the stage use. The 900 and its follow-ups were made to be more portable, louder and have more power than traditional Leslie speakers. It is believed that the PRO 900 was an invention of the CBS corporation who had acquired Electro Music from Don Leslie some years prior. However, the solid state amplifier design was a Don Leslie creation. By today's standards this design, with its inter-stage transformers and electrolytic capacitors in the signal path, seems antiquated but back then it was a highly advanced amplifier that did exactly what it was supposed to do: Make a Leslie sound like a Leslie. The solid state Leslie amplifier was tweaked and improved upon over the years, but the basic circuitry remained in place until integrated circuits replaced the discrete components in the late 70's. Along with the solid state amplifier for the sound (more on this later) came solid state motor switching. The ability to stop the rotor(s) was a standard feature. Concurrently with the Pro-type Leslie speakers, Electro Music issued new speaker models in both the traditional and 'decorator' cabinet designs featuring the new solid state technology. Some of these will be briefly mentioned in the following.